The game begins with Deirik and Eirik’s family’s trading stop in the city of White Cliff. They have already dropped off the goods they are giving and are headed to the location where the goods they are receiving are hidden. Deirik and Eirik, and the rest of their father’s crew go to the barn with their goods to retrieve, only to find the crates and barrels are empty and they’re being approached by an orcish force. During the ensuing battle, several of the men die, including their father, Yakob. 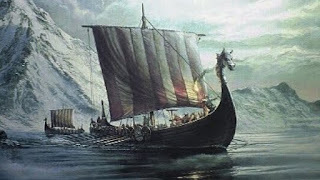 While their Uncle, Torvald the Elder, offers to take the lead, Deirik is the rightful leader according to the rules of succession and takes on the mantle of captain. With no goods to retrieve, and no knowledge of the people Yakob worked with or deals in place, the brothers take it one step at a time and go to the city of White Cliff to talk to their cousin, Torvald the Younger, whom they find was abducted by Legate Voldash too long ago for them to follow. Rhald, aka “Rowdy” and his wife, Sorna, their trade points of contact in White Cliff, reach out to tell them what they know of Torvald, but can’t help them there. Rowdy can help them get more boro meat and skins, to keep the trade route going, by telling them about some nearby Shadow controlled farms from whom they can steal. The brothers successfully take out the orcish guards, steal some boros, and return home with the goods and news of what happened. They tell their mother, Jani, and little sister, Rhiann, about their father, both of whom break down in tears. They then tell the matriarch, their grandmother - Rhiann, and she tells them the family relies upon them now, to look to Uncle Torvald for guidance, and wishes them well. She only cries when she believes Deirik and Eirik are out of earshot. The brothers rally their crew and head back onto the Brunhilda to go up the Be’neeya river. Their next stop is Alucard, a small town controlled by Legate Krogan. Krogan greets them with his oruk, Tog, by his side. He tells them he recognizes their ship, but not them. For him to do business with them, he’ll need proof that they’re loyal and capable. As such, he conveniently has a task for them. A Witch Taker Legate named Tion had come through Alucard and grabbed a few of the towns’ children very recently. Krogan wouldn’t go up against him himself since they’re both Legates, but he knows this will only disrupt the status quo in his town and he’d prefer that not happen. He tells Deirik and Eirik that if they can retrieve the children for him, he will work on a new trade deal with them. Their Uncle Torvald refuses to allow them to enlist any of the crew’s help in this quest saying he believes it to be a suicide mission, so Deirik and Eirik strike off, happy to save kids, take out Shadow forces, and enhance their business all at once. It is a difficult battle with Tion casting his spells while his orcs keep Deirik and Eirik at bay, but eventually they power through and bring the kids back. Krogan takes charge of them and presents them to the town, who lauds Krogan for his justice and mercy. Afterwards, Krogan meets up with the brothers and makes a new trade deal with them, giving them what he would’ve given Yakob for what he expects in return. The Sea of Pelluria, the heart of the campaign. Another success builds the brothers’ confidence as they progress further up the Be’neeya River. Their next stop is a village in the far North called Grodatch, very close to the Shadow city of Steel Hill. Here the brothers, not knowing who their contact is, move about the town hoping that the contact finds them instead. Gathering information and some smooth talking leads the brothers to the Vanak brothers, Ian and Shayne, who are a bit skittish around new people, especially those who want to do business, as they are leaders of the local resistance. Again, Deirik and Eirik must prove themselves. They’re sent to a local Shadow Fort to steal a ledger from the desk of the Legate in charge, and also kill at least two orcs and bring back their heads. Stealthy as they are, the ledger proves to be of little difficulty to obtain, but the two heads, being attached to orcs who’d rather keep them, is a bit harder. However, the deeds are both done, and the Vanaks agree to trade with the men of Mjarn. Now that both Be’neeya stops are resecured, there’s only one left: the elves of Erethor Forest. The Brunhilda glides down the Be’neeya. On the way down, Deirik and Eirik spot a slave caravan full of Dorns headed North and can’t let it go, feeling they have to do something. Their Uncle Torvald, again, informs them they are being foolish and sternly warns them not to take any of the crew with them. A difficult fight ensues but the brothers succeed in freeing the slaves and return to the boat victorious. After making it the rest of the way down the Be’neeya, the men stop at home shortly before continuing on to Erethor. The Elves, being a hunted race, never leave their forest and are hard to find, but as they approach the area their father typically considered their destination, an arrow sunk into their bow. Since there were no arrows to follow, the brothers considered this the way the elves let them know where they are. 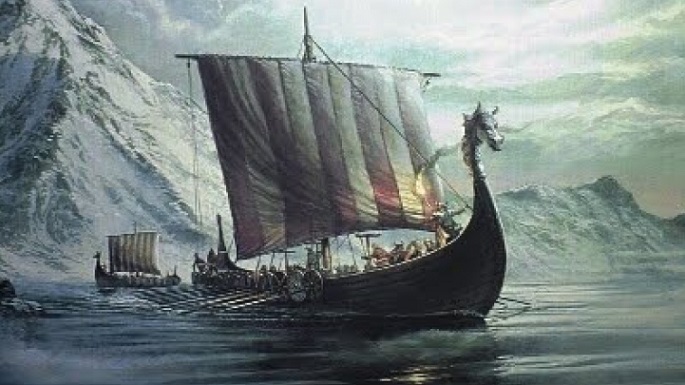 Deirik and Eirik brought the boat to shore and had a quick meeting with the elves where they explained what happened to their father and that they’d be taking over the business. The elven leader, Yallanan, agreed and traded with the brothers as he did not want to spend much time out in the open. As time went on, the brothers became more confident and better established in their business. There would continue to be small conflicts here and there, they would risk their lives for the sake of others and come out victorious, typically without any support from their crew as their Uncle continued to warn them away, saying they had no right to risk anyone’s lives but their own. Time passes, trades are made, and life continues. Things begin to run so smoothly, that the brothers begin construction on a second, sleeker boat with the intention of using it to explore and expand the business, finding new trading partners to add to their portfolio. While this boat, named Var, is under construction, they continue on the Brunhilda. After some time, the arguments between the brothers and their Uncle become more heated, the Uncle pointing out their impetuous and foolhardy nature, the brothers doing everything they can not only for their family, but their people. It all comes to a head though when the brothers are returning back to the boat from a village near Alucard. As they’re walking the path that takes them toward the forest they must pass through, Uncle Torvald appears at the edge of the forest surrounded by summoned creatures and begins casting attack spells towards Deirik and Eirik. It takes a moment for the brothers to realize their uncle is truly trying to kill them. They spring into action, attacking the summoned creatures and their uncle. Deirik is knocked unconscious in the fight, but not without doing some serious damage; enough such that Eirik is able to finally take down his uncle. Eirik then races into action, trying and succeeding to stabilize Deirik. Lord Krogan steps out from the woods, obviously having observed the whole thing, and heals Deirik... to the victor goes the alliance. He then explains what he learned from their Uncle as he walked here to confront them: Torvald the Younger is still alive and is being trained as a Legate himself. Both Torvalds (Elder and Younger) arranged the ambush that ended up killing their father, and all along Torvald the Elder was hoping that the brothers would get themselves killed so he could take control of the business which would then operate under his son’s authority once he becomes a full Legate. Deirik and Eirik are furious, and rightfully feel betrayed. So they quickly return home to deliver this news to their beloved grandmother, Rhiann. They suggest that Torvald the Younger’s sisters, Lianna and Kari be married off to other clans, while his mother, Minka, is kept in the Cave of Mjarn as insurance, to which Rhiann agrees and the arrangements are made. Now that they’ve taken care of the family issues, they turn their attention back to the family business and their new boat, Var. Deirik and Eirik set off toward the elves. With such a large forest, there have to be more groups interested in establishing trade than just Yallanan’s group. 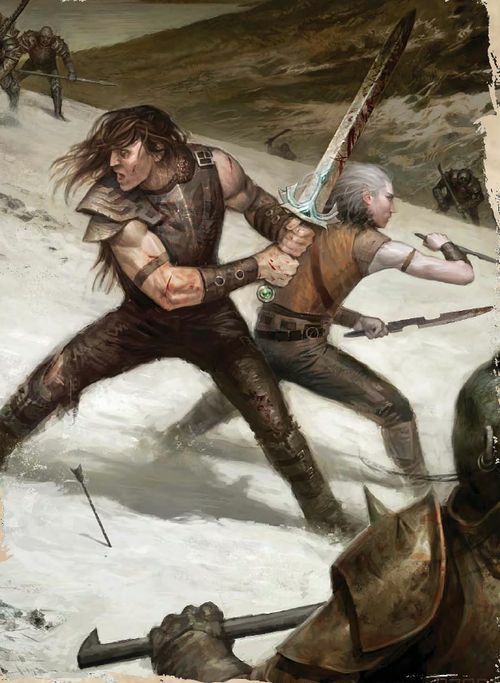 Beyond that, both brothers have heard of the elves superior bow-making skills and are very interested in a collapsable mighty bow of icewood, and learn of a bowmaster amongst the Snow Elves to the north named Kieran. They head north and meet Kieran’s tribe, who are only speaking to the brothers because Yallanan vouched for them. However, vouching only gets them speaking, trust is built through actions. The brothers, knowing that the family business is still running strong on the Brunhilda, take the time needed to win over the snow elves, helping them fend off goblin and orcish attacks. Kieran, eventually returns with the icewood bows the brothers covet and hands them over with a request that they assist with one more task.